Built a carving knife for a buddy who’s going to be without a shop for a while. He may not carve yet, but maybe he’ll be able to whittle a little while he’s waiting to get back into the shop. Started out with a Morakniv 120 blade blank. It’s a shorter blade which I find really handy for detail work and which is recommended for beginners. It’s a laminated blade, so high carbon steel in the middle, with softer steel down the sides. 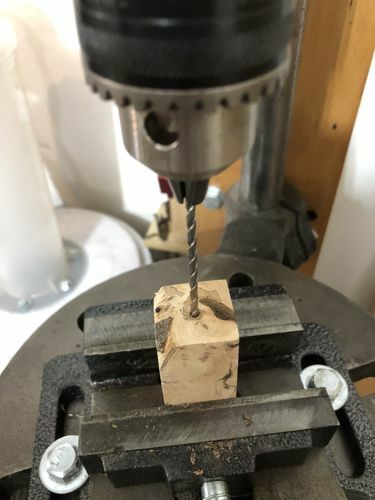 I drilled a hole into a chunk of apple I had on hand. On the Morakniv blanks, the tail of the tang is a little more than 3/32” so I drilled a 1/8” hole all the way through the handle-to-be. Once that was done, I put the blade in my face vise, and heated the tang to just short of red hot using a MAP gas torch, then plunged the handle onto the tang, burning a hole into the handle. No pictures, since I wanted to keep things moving, and it took about six times to get the hole full length. Once the hole was in, I cut 8-32 threads onto the tail end of the tang and got a nut ready. Then I put the brass bolster onto the blade, filled the hole in the handle with epoxy, then put the handle onto the blade, screwed down the nut, and cleaned up the epoxy that had gotten pretty much everywhere. After the epoxy cured, I shaped the handle and bolster on my belt sander using a 60 grit belt, filled the voids and bark inclusions with more epoxy, cut off the excess tang, peened the end of the tang into the nut, then hand-sanded the handle up to 240 grit. Plopped it into a jar of linseed oil for about a half hour, then wiped it off. While the knife was drying, I made a sheath out of a couple scraps of walnut and a scrap of eucalyptus. Cut the shape of the blade in the eucalyptus, then sanded it to about the thickness of the blade and glued the pieces together. It was a little too tight, so I had to spend some time with a thin file fine-tuning the fit. Beautiful work your Buddy should be well pleased. Like the brass tang, may have to try that out one of these days! Andre, the hardest part about the brass bolster is getting the right sized (and shaped) hole in it for the blade to go through. I hand-shaped this one, and it was a ton of work. 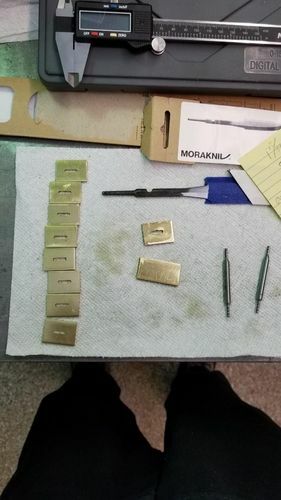 For future knives, a friend of mine used his mill to make up a batch of bolsters for me that should make life much easier. I had planned to peen the bolster onto the blade, making sure the fit was perfect, but I’m leaning towards having it pretty darned close and just filling any gaps with epoxy. It’s not perfect, but I think it’s good, and it doesn’t take hours of work. I guess I’ll find out for sure on the next one I make. I’ve got eight mode blade blanks, so hopefully I’ll have things figured out by the time Ihave to reorder. Dave – great project set. Sweet looking handle. Thanks, Bill. You’re also going to be shop-free this summer, right? Need a carving knife for your pocket shop? Since I know who the “shopless buddy” is, I’m looking forward to trying this out. I need to find some basswood and learn about carving. This might also be a good tool to use to make a shopless BBQ Swap item…. Sure thing, Earl. Green oak or ash would also work nicely for making a burger flipper or something like that. Jögge’s Swedish Knife Grip Sessions has a butter knife and spoon and maybe spatula which are all BBQ-adjacent projects, if not right on. Nice. I am going to have to look into those blades. Very functional knife. Thanks for showing the process. I’ve got their two main hook knives too. If you have questions, ask away. Or look at the hook knife sections of the Swedish Knife Grip Sessions. Thanks guys. Their stock handles are useful, but I like being able to make my own. Nice to have a custom knife. Wait – I thought you just cleaned house??? There is always that corn handle knife….